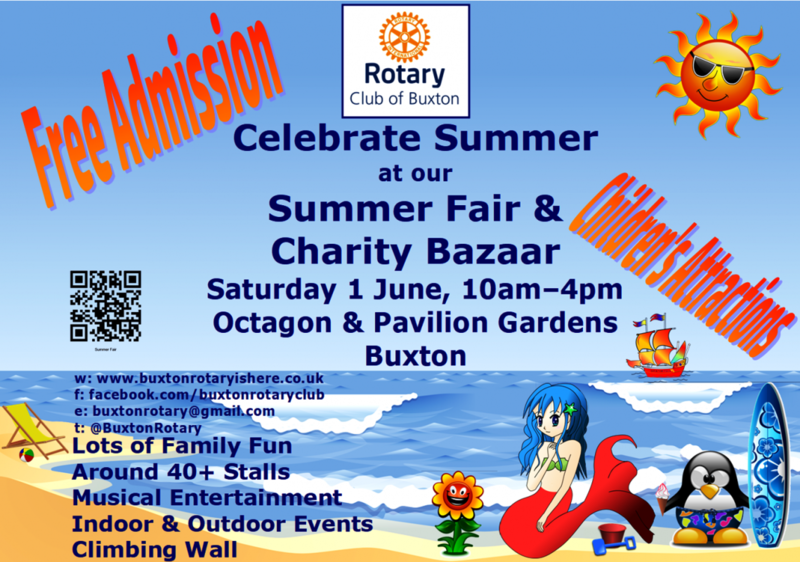 FREE ADMISSION EVENT IN PAVILION GARDENS, BUXTON This year, the Rotary Club of Buxton Summer Fair and Charity Bazaar continues with the theme of "Celebrating Summer" with stalls by local charitable organisations, support groups, and voluntary bodies decorated accordingly. Their goods and games are complemented by entertainments, other attractions, and music both inside and outside. There's also the Grand Draw - 50p/ticket for a chance to win cash prizes and goods donated by local businesses. The Mayor arrives at noon to judge the stalls and award prizes for the Children’s earlier-held School Handwriting & Picture Competitions; entries will be exhibited. This is definitely an event you don't want to miss and a great family day out. Climbing Wall; Archery; Food Stalls; Sweets & Donuts; Model Boats on Lake; Brass Band in the morning; Games of Skill; Carousel, Fairground Stalls & Trampoline; the Treasure Trail; Bogtastic’; Erin Hounds; Sandy Beach; Space Hopper Races; Ball Games; Hook A Duck; ‘Tin Can Alley’; and more … weather permitting. Great fun for all!